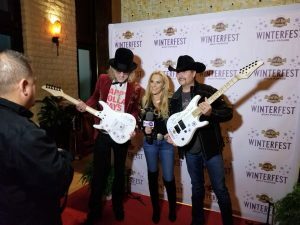 As Big & Rich, John Rich and Big Kenny Alphin have exerted a definite “gravitational pull” to the direction modern country music has taken. Their much anticipated new project, “Gravity” provides a stellar example of the genius of their creative brotherhood–the result of two unique musical personalities colliding to form an even greater positive sum total. The project has propelled the superstar duo to new heights, having secured back-to-back Top Ten hits for the first time in their career with “Look at You” and “Run Away With You,” while their current single, “Lovin’ Lately” featuring Tim McGraw continues to climb the charts. They are America’s Technicolor cowboys, brothers-in-arms in service to the creed that great music has no boundaries. 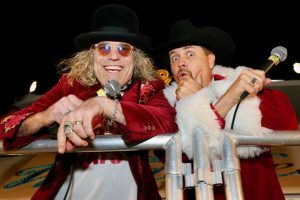 Individually, John and Big Kenny are first-rate musicians, songwriters, producers, entertainers—and now the creative force behind their own label imprint, Big & Rich Records. Together, they are one of the most truly original musical forces ever unleashed on a welcoming world.